As a segment of the student population that is projected to grow more than twice as fast as traditional students from 2012 to 2022, colleges and universities are taking a closer look at the growing non-traditional student demographic. But who exactly are non-traditional students and why should higher education be paying attention? Non-traditional students shoulder a variety of responsibilities that add complexity to the decision to enroll in college. Based on Barnes & Noble College Insight’sSM previous research, while traditional students are more likely to attend college for social reasons or because of family expectations, non-traditional students are much more likely to attend in order to change careers, set a good example for their families and earn more money. 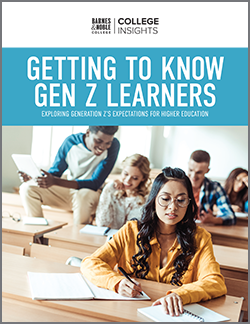 They include students who are 25 years of age or older, enrolled in an online or distance-learning program, first-generation college students, employed full-time during school, responsible for dependents, of veteran status, or re-entry students. 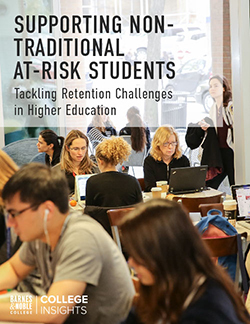 At a time when many colleges and universities face increased challenges to their recruitment and retention goals, a deeper understanding of this non-traditional student population is crucial to helping to meet the social and academic expectations of a growing student population. The Achieving Success for Non-Traditional Students report investigates the diverse non-traditional student journey and explores their unique social and academic needs and expectations, the barriers they encounter, and ways to help them achieve greater levels of success.